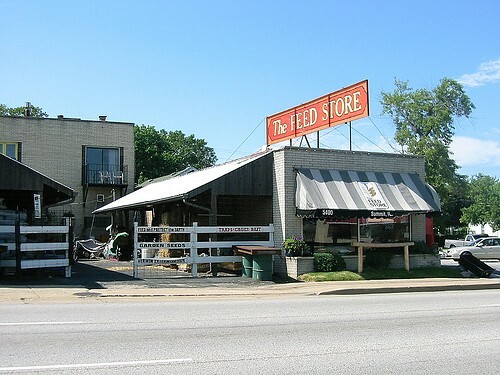 You’ve probably cruised by the Feed Store in Summit many times – it’s been around for over 60 years, since the days when farms actually existed in the area. My daughter and I went last there last weekend, and I had no idea it’d be photo-worthy, so I didn’t bring a camera, but I did find this shot on Flickr. Next time I go, and that will be soon, I'll shoot some interiors. The Feed Store is pretty cool. I bought some bales of straw for my garden, but what really intrigued me where the chickens. Years ago, GWiv speculated that tending chickens seemed something I’d be well-suited to; not sure I’d be well-suited, but I’m game. Now. My understanding is that the People’s Republic of Oak Park allows residents to keep two live chickens (and an unlimited number of frozen ones) on their property. Two baby layers from The Feed Store will not run more than $8. The cage will be around $180, and I’ll need some kind of enclosure to keep out local predators (mostly domestic cats on the prowl), but I’m loving the idea of having fresh eggs in my backyard. And livestock. I found a bag of squirrel feed and asked the lady behind the counter if this was for real, I mean, Who feeds squirrels? Turns out, the lady was part of a squirrel appreciation society and actually feeds them right from her lap: "they're quite the little clowns; I just like to watch them," she said to me with big earnest eyes. Sounds wacky, but it takes all kinds (or, at least, we have all kinds). However if, like Squirrel Lady and GWiv, you’ve got a thing for squirrels, you can find out more at http://www.projectsquirrel.org. Me, I see chicks in my future. They look pretty cool, but I'm sure my wife would kill me if we had a chicken in our backyard. We had a pair of ducks in our Oak Park back yard a few years back. Never had any trouble with the Village but I suspect the neighbors got a little irritated at times. Ducks are a bit noisy for the city. Backyard chickens aren’t just in the stories told by grandparents. Join Andrea and Kz Plamondon as they share their knowledge of the backyard chicken. They will cover topics from how to get started, different starter kits and moveable chicken tractors, to breeds and feeds. The class is a 1 ½ informational session. Building materials and baby chicks must be pre-ordered by May 29th. I haven't been there for any classes, but drove past this week and it certainly looks like a fun place. Perhaps they'll have another chicken class soon. 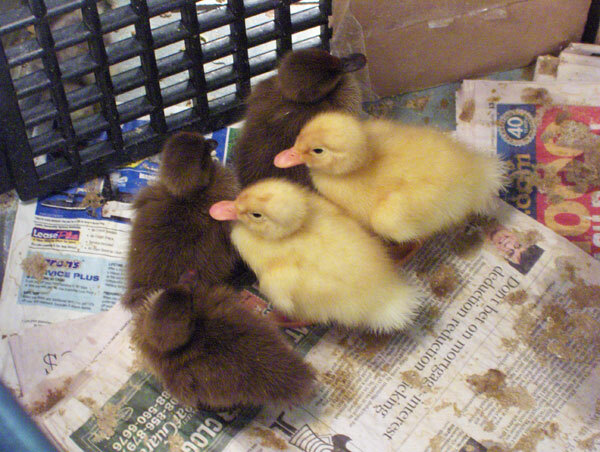 On my recent trip to Marseilles, the local Farm and Fleet in Ottawaalso sold live ducklings and chicks. I learned Farm and Fleet will not sell anything less than two ducklings to a customer. Ducklings are social animals who will quack themselves to death, refusing water and food, until they are paired up with another duck or duckling. Life is an adventure, if you want it to be. Ottawa Farm & Fleet, Inc. There are a lot of cats in our neighborhood, and I'm concerned about them and other predators eating chicks. At The Feed Store, they had a beautiful cage that looked a little like a mini-Thunderdome that provided protection for chicks and lots of room to run. I can't see putting that in my back yard, but I need to find a way to let the birds run while staying protected. Have yet to seriously discuss this with The Wife...waiting for an opportune moment. David Hammond wrote: I need to find a way to let the birds run while staying protected. Put 'em on a leash? This would be why they call it chicken wire (I liked the one at the bottom of the linked page called "the ark.") 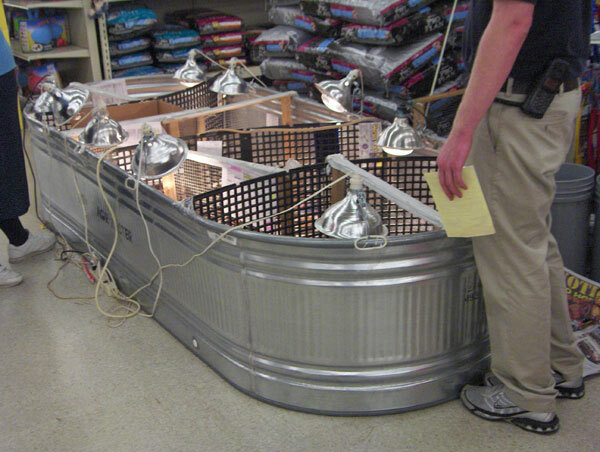 The title of the article trs23 linked is called "How to Pay Too Much for Home Grown Eggs" with good reason - this one, also very expensive - just the plans cost $40 - is nicely camoflauged as a planter, but will run you a grand for an unassembled kit, and $1.5K for a fully assembled one - without a run. Mhays wrote: This would be why they call it chicken wire (I liked the one at the bottom of the linked page called "the ark.") The title of the article trs23 linked is called "How to Pay Too Much for Home Grown Eggs" with good reason - this one, also very expensive - just the plans cost $40 - is nicely camoflauged as a planter, but will run you a grand for an unassembled kit, and $1.5K for a fully assembled one - without a run. Like a home garden, I'm expecting that homegrown chickens will "almost" make economic sense. Well, and like a homegrown garden - you can do it the cheap way or you can do it the expensive way. Mhays wrote: Well, and like a homegrown garden - you can do it the cheap way or you can do it the expensive way. Even if you're trying to go on the cheap, the initial downstroke for supplies (seed, mulch, frames, etc.) makes the crop for the first year or two seem unreasonably expensive. My guess is that even going cheap, the first egg I pluck from my henhouse will cost over $200. Palermo was raising chickens were it wasn't permitted, so I have less sympathy for her, though I can understand how neighbors might react poorly to backyard fowl (especially if there's a rooster involved). I've checked with my neighbors on both sides, and they were all totally gung-ho about my getting some chicks (I've become kind of the eccentric old fart on the block, so fortunately they seem to find me more a harmless amusement than despoiler of neighborhood peace and quiet)...plus, I'm sure they know they can rely upon me for the eggs. I have, in fact, encouraged all neighbors on all sides to come into my garden any they want and take home whatever looks good. Every now and again, I see the dad next door bring his daughter over to pick strawberries or peas, and I think that's just wonderful: there's more growing than we can eat. How about this chicken coop? With a run, it costs $995. without any discussion of shipping and handling. Cost of big toy, chicken and feed, you may have the fanciest $1 per egg chicken farmette. Anyway, what are you contemplating for housing the chickens? I emailed Oak Park's "Chicken Lady" yesterday and she emailed me back her phone number -- I'm going to speak with her about chicky housing options. She uses a homemade A-frame structure, which makes sense to me; The Wife has greenlighted the northern side of the garage for chicken production (very protected and near the garden, for easy shoveling). I'm not going to spend a grand on a coop...I don't think. When it comes to laying hen breed, you may want Araucana. Sources advise if they are hand-raised specifically, they can be extremely well-tempered, calm and trusting. I bought eggs from a gal in Hebron whose laying hens were Araucana. She wanted well behaved laying hens around her boyfriend's children. The added bonus, the eggs are blue, green and pink aka Easter Eggs. These Araucana hens lay for 3-4 years instead of 5-6 years of commercial hens. "Well-behaved" may not be what we're looking for. We're clean out of kids at our house and I think a mean-natured hen might have a better chance of surviving in the wilds of the PROP -- there's varmints out there, cats, raccoons, possum, who knows what all else. When the chicks are young, I will have them in a protected enclosure, but as they get older, I will give them freer range. For those of you who are container gardening and think your peat based soil is too damp, products like pine bark, Turface and granite that you feed to turkeys and chickens can help make a fantastic mix. This morning I borrowed the neighbor's car and headed to The Feed Store. Good thing I needed to also go a bit farther to the NAPA store, too, because it comes up very quickly after you get onto Harlem from the expressway. The Feed Store had grower size granite - perfect for a container mix. Just down the street is the NAPA Auto Parts store. A stop there netted me a very large bag of oil dry for $6. It's actually diacetemaceous earth! Given that about a quart of this stuff costs upward of $10 at a Chicago garden center, this is a find. It, also, can work well in a container mix. My lucky day to find both of these within a mile of each other. David Hammond wrote: "Well-behaved" may not be what we're looking for. We're clean out of kids at our house and I think a mean-natured hen might have a better chance of surviving in the wilds of the PROP -- there's varmints out there, cats, raccoons, possum, who knows what all else. When the chicks are young, I will have them in a protected enclosure, but as they get older, I will give them freer range. 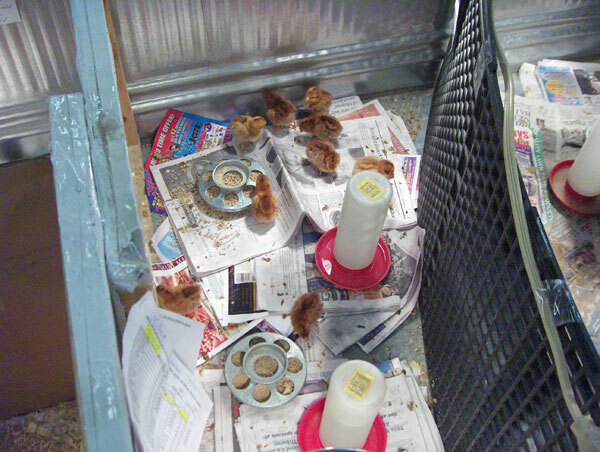 You'll still want to bring your chickens in for the evening and secure them in their coop/run. Chickens have no night vision and make easy pickings for any predators at night. If you don't want to buy the omlet pre-fab chicken coop/run, take a look at their website to garner some useful information. The anti-digging-varmint wire is a good thing to have for the run. You might want to consider making it similarly with a swinging door (to easily harvest eggs) and a remove-able dropping tray for easy cleaning. They'll like dirt or wood chips better than grass (if that's where you're gonna set the coop/run). You'll want to make sure they have grit to aid digestion (if setting on a lawn). Make sure you've got at least a 5 foot fence, and you'll want to trim the feathers on one wing so they can't fly away if you plan to "free range" 'em in your yard. The omlet website is a good resource. Good luck with your chicken-raising. I'm planning on starting soon (now that we own a home). Someone at work has a kid who's class raised 7 chickens and their planned destination post-school has become a no go. So if anyone is interested in seven healthy chickens, please let me know. motu wrote: Someone at work has a kid who's class raised 7 chickens and their planned destination post-school has become a no go. So if anyone is interested in seven healthy chickens, please let me know. Check your local laws. Some suburbs (Mount Prospect for one) specifically ban home livestock (MP prohibits chickens, pigeons and bees, specifically).